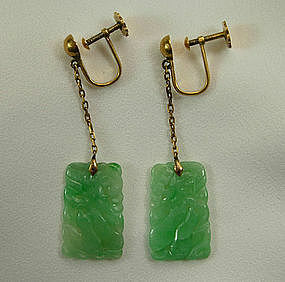 Gold screwback earrings with large carved apple jade drops. 1920s, with Chinese marks. Also marked 14K. Together they weigh 4 grams. Nice size -- 2 inches long and 9/16 inch wide. Excellent condition. One jade drop has a line -- it is visible in photos. It can be felt on the outside but the stone is completely stable and is not noticeable except in enlarged photos. Photos enlarged to show detail.